Of all the traditional seafoods in Southeast Alaska, none are more shrouded in myth — and genuine risk — than clams and mussels. Paralytic shellfish poisoning (PSP)killed two people in Southeast in 2010 and dozens more have fallen ill over the recorded history of the state. For subsistence harvesters, there has been no way to measure the risk of clam digging — until now. In part 1 of a two-part series, KCAW reports on a partnership among Southeast tribes to create a regional water monitoring program. In Southeast, between Chicagof and Baranof Islands, there’s a waterway called Peril Strait. The name doesn’t come from winds ripping through the channel, but from a shocking event that happened in 1799. “A Russian ship came in and the villagers had gone out and collected a bunch of clams from an area now called Poison Cove,” explained Jeff Feldpausch, the Resource Protection Director for Sitka Tribe of Alaska. Eat the wrong clam and you can die on the beach. That’s the grim pathology for PSP, which one state publication in 1982 called “Alaska Roulette.” In order to protect subsistence harvesters, the Sitka Tribe decided to invest in the latest science and to look really closely at what the clams themselves are eating. I met Esther Kennedy of STA’s Resource Protection Department near the Starrigavan dock. She took note of the day’s conditions. “So it’s 10AM, it’s sunny, it’s calm.” Every Tuesday, Kennedy starts her morning by collecting water samples. From far away, it looks like she’s flying an underwater kite, dragging a net sedately through the water as microscopic creatures called phytoplankton get trapped inside. 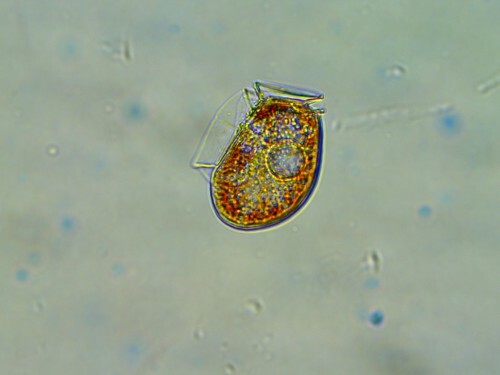 Alexandrium is a genus of dinoflagellates that leads to Paralytic Shellfish Poisoning. 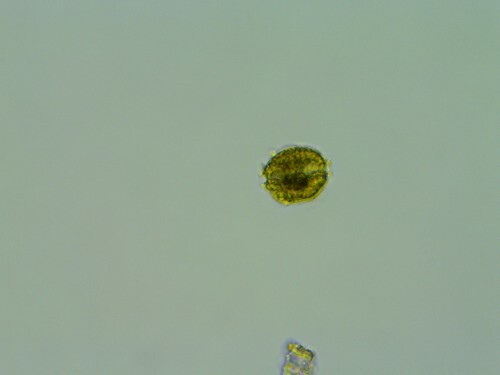 This cell was identified by a team of researchers at NOAA’s biotoxin testing lab in Seattle. (Photo courtesy of NOAA). The vast majority of phytoplankton are totally harmless. But a few of them, particularly of the genus Alexandrium (they look like an acorn under the microscope) produce a chemical called Saxitoxin. Saxitoxin is 1000x more potent than cyanide, so potent it’s listed as a chemical weapon by the US military. Saxitoxin is what’s responsible for PSP. The timer beeps. Three minutes are up and Kennedy pulls up net and bottle – now filled with water. 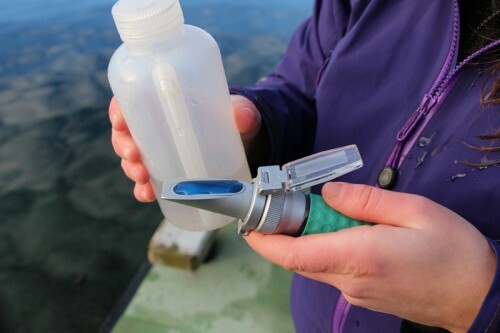 She’ll take these drops of water back to a lab, and using a microscope, count what kinds of phytoplankton, toxic or not, are in the water that week. So, how do these tiny creatures poison us? It works like this: when toxic-bearing phytoplankton accumulate in the water, it’s known as a harmful algal bloom, or a HAB. Some HABs are visible, even red, earning the nickname “red tide,” but many are not. As shellfish feed, the bloom’s toxins get trapped inside and have the potential to poison whoever eats the shellfish, whether a sea lion in Kodiak or a subsistence user in Klawock. “Here we are living with hundreds of bears wandering that will wander through the streets, but everyone is worried about the clams,” said Chris Whitehead, STA’s Natural Resource Specialist. Chris Whitehead joined STA’s Resource Protection Department in the fall of 2013. In his former home of Washington State, there’s a hotline you can call to know which beaches are safe for shellfish digging. No such system exists in Alaska, so Whitehead wanted to create a local solution. He pitched the idea for a HAB monitoring program to several tribes. The response was instant. “This is kind of the first step or kind of the poster child for collaboration on environmental issues,” said Jeff Feldpausch. Six other tribes have signed on for the project. Together, they form Southeast Alaska Tribal Toxins group, or SEATT, with membership from Sitka, Juneau, Yakutat, Petersburg, Klawock, Craig, and Kasaan. 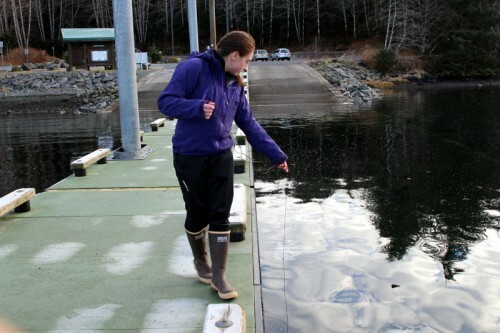 Matt Anderstrom does the water testing for the Yakutat Tlingit Tribe at the Yakutat Lagoon. Two weeks ago, the lab saw its first sighting of Alexandrium – that’s the one that makes Saxitoxin. It was spotted by his younger daughter, Nellie. Using the data field workers like Anderstrom and Kennedy are gathering, each tribe hopes to eventually create an early warning system for toxic bloom events in their area. In Sitka, Feldpausch imagines it will be a stoplight published in the daily paper. “A green should be good to go, a yellow is proceed with caution, and a red, we have found saxitoxins out there,” said Feldpausch. Right now, the Sitka Tribe is only testing the waters at Starrigavan. Feldpausch recognized that may not be enough for some harvesters. Each tribe has focused their first year of fieldwork on one site and for Sitka, the choice of Starrigavan is strategic. In 2013, two locals suffered mild PSP cases in the middle of October. So the old rule of thumb, that safe harvesting months had an “R” in them, basically September through April, is no longer true. In 2012, Alaska Magazine got in trouble with the state for saying otherwise. With PSP a threat any time of year, Whitehead says it’s more important than ever for communities to reclaim their beaches and know exactly what lurks in the water. 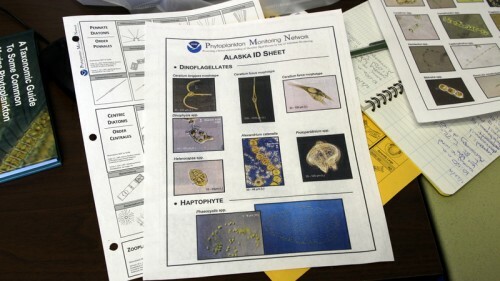 For more on PSP safety and prevention, check out the Alaska Department of Environmental Conservation‘s fact sheet.